The Continental GT3-R arrives as a road-going counterpart to Bentley’s perhaps unexpectedly competitive endurance racer. Just denied a podium finish on its debut in the Gulf 12 Hours at Yas Marina last December, the Conti GT3 netted Bentley’s first British race win for 84 years at Silverstone in the Blancpain last summer. 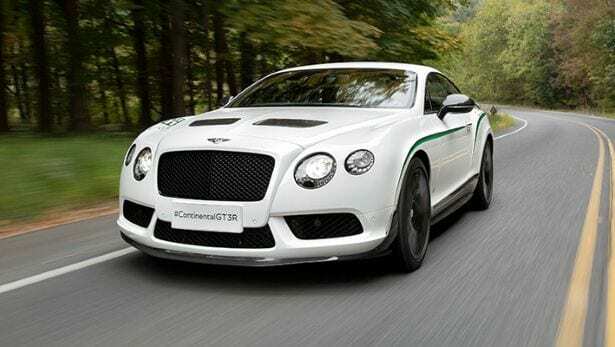 So it’s Bentley’s take on the Porsche 911 GT3 or Ferrari 458 Speciale, then? Not quite. This isn’t exactly a road-going race car reboot. See, the GT3 race car runs Bentley’s 4.0-litre, twin-turbo V8, good for 600bhp unrestricted, fired to the rear wheels only via a carbon fibre propshaft and harnessed by Xtrac’s fabulous six-speed sequential ‘box, fitted as a transaxle to optimise weight distribution. It also loses the front driveshaft, and its doors weigh a skinny 7kg compared to the road car’s thumping 57kg. All in, it weighs 1295kg. This new GT3-R is 100kg lighter than the regular road car, but still heaves itself onto the scales at 2195kg, which is roughly a Caterham Seven more, for example, than the 458 Speciale. The engine is Bentley’s familiar 4.0-litre V8, whose brace of turbos have been tweaked to run extra boost, pumping the power output up to 572bhp, and shovelling out 516 torques from a sleepy 1700rpm. More significantly, the Continental’s ZF eight-speed transmission now runs shorter gearing, cranking the acceleration to warp factor nine as the GT3-R streaks to 60mph in 3.6 seconds and beyond to its reduced 170mph top speed. Bad for its Top Trumps status, good in every other meaningful respect. Unless you own your own circuit, which is a distinct possibility at this stratospheric level. The GT3-R also gains torque vectoring on the rear wheels for the first time, as well as recalibrated software for the car’s drivetrain modes and a slightly more playful stability system. There’s also a new titanium exhaust system, which accounts for seven of the 100kg the R has lost, as well as giving it the full Brian Blessed ‘Gordon’s alive!’ roar. That, plus the glacier white paint-job, green go-faster stripes, wing decals and carbon fibre diffuser and huge rear wing suggest that this particular Bentley isn’t backwards about coming forwards. Or possibly sideways. But will it still waft like a Bentley should? Obviously there’s an overwhelming urge to bury your right foot at the first possible opportunity, but initial impressions are dominated by an amazingly composed ride quality. Despite wearing 275/35 ZR rubber all-round wrapped in 21in forged alloy wheels, it does a fine job of shirking off gnarled tarmac. The Conti’s air springs and dampers have been track-optimised, but the revisions don’t hurt its everyday useability. The reworked cabin is a… challenge. The bespoke carbon fibre seats themselves are superb, there’s diamond-quilted Alcantara facings on the doors, and handcrafted carbon fibre on the dash. Even the paddle-shifters have been redesigned. But the greenery on the exterior graphics is nothing compared to the accents that have been added inside. It’s Bentley’s motorsport colour, and the same shade of green is all over the reception area of its Pym’s Lane HQ in Crewe. But yeasty toast enlivener Marmite is nothing compared to this when it comes to polarising opinion. And what about when you finally bury that right foot? Acceleration and deceleration – thanks to 420mm carbon ceramic front discs and 356mm rear ones, and eight-piston calipers – is now sufficiently mighty to give you an instant facelift. There’s maybe a nano-second of hesitation as the R prepares to throw 2.2 tonnes down the road, but the surge is so brutal it really is scarcely noticeable. That mass limits just how much fun you can truly have in a corner, but it’s still way more than you’d expect. What it lacks in light and shade – the steering could use more feel, for example, the chassis a little more interactivity – it makes up in sheer, unstoppable momentum.